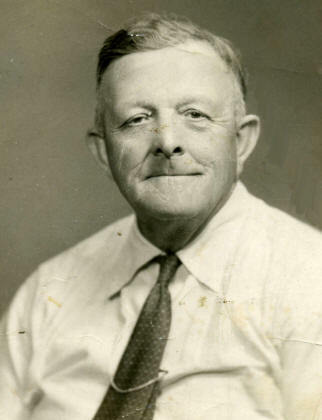 Otis Caldwell Goble was the third child born to Jacob Hedrick Goble and Frances Elizabeth Douglas. 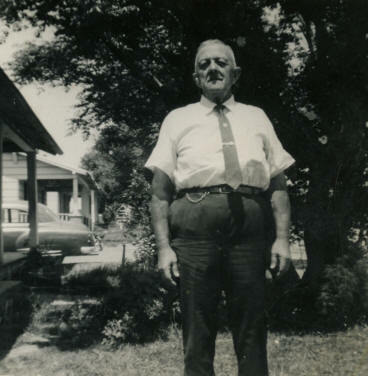 Otis (or "Od" as he was called by family and friends) was born 02 Sep 1894 in Alexander County, NC. By 1910, Jacob and Fannie only had 3 children. Eliza Jane had drowned in the Catawba River on the way home from church in 1907. Jacob's age is correctly listed as 49. The Goble family also had a servant, Nessie Johnson, living with them in 1910. Before the year was out, Nessie married Od's brother, Martin Luther Goble. Od's age was listed as 15-years-old. By 1920, Jacob and Fannie had moved the family to Iredell County. Jacob's age was 59 and Fannie was 58. Their daughter, Rebecca, married Marvin Bunton on 29 Apr 1917. Rebecca, Marvin, and their son, Ralph, were living with Jacob and Fannie. 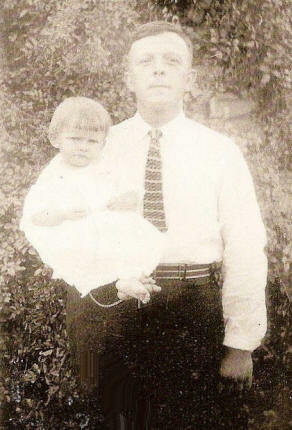 Otis married Lacy Shoemaker on 21 Jun 1916, but by 1920 he was living with his parents and sister. His occupation on the 1920 Census is listed as a "cleaner" at the Cotton Mill. The 1930 Census lists him as a Widower. Od was 33 in 1930 and was still working at the Cotton Mill. His marrital status was listed as "Wd." or Widower. Od married Ruby Jolly on 08 Jul 1934. 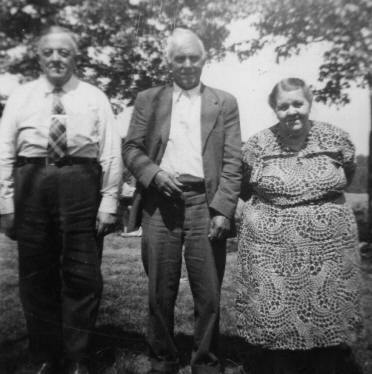 Otis never had children of his own and was fond of nieces Fannie Bunton and Willie Goble. 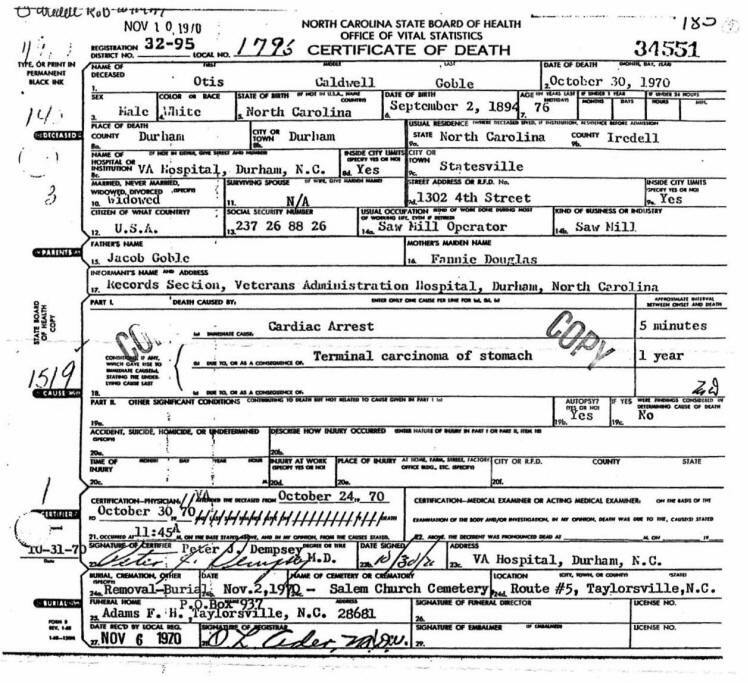 Otis Caldwell Goble died 30 Oct 1970 at the Veteran's Hospital in Durham, NC. He was a widower and his age was listed as 76. His occupation was listed as a "Saw Miller Operator". Od died as a result of a heart-attack and was also listed as having cancer of the stomach. He was buried in the Salem Church Cemetery in Taylorsville, NC.